ATV-3050C is a mini-size ATV. This streamlined vehicle, powered by a dependable 4 stroke 110cc motor. The durable double A-arm Front Suspension, Single Rear Suspension, drum/disc brake, and improved engine design will ensure a ride that is a cut above. 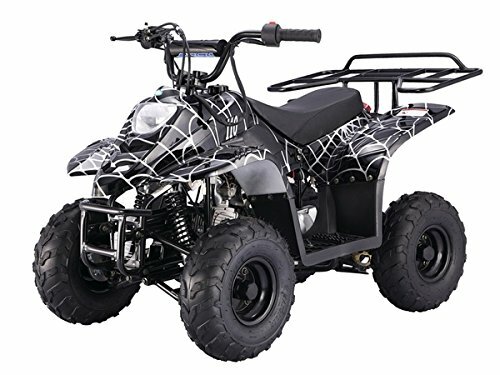 This ATV normally retails for a much-inflated price, but due to the fact that we manufacture our own ATV's we can offer it here at insanely discounted prices. The ATV lightweight and low maintenance make it perfect for casual yard, field, and trail riding. Emphasizing the safety and consideration, this mini quad mount with most helpful safety features, as Remote Control, foot brake, Automatic transmission and electric start. It will be safe along with the right size for growth. These quads also come with luggage racks on the rear. These allow you to carry up extra weight to make sure you have everything you need while riding. Smooth and reliable 110cc engine gives you the chance to enjoy a type of fun only realized with the time riding with your family's ATV's. This high quality ATV will give an abundance of fun & memories! Our products are causing an excitement in present ATV markets. All our ATVs are made under very strict quality control by ISO 9000 system. The ATV-3050C has the similar performance, facility and reliability as many brand names ATVs. Anyhow our price is only half, or one third, or even one fifth of their overly inflated prices. Why not enjoy the same experience and fun with a brand item by saving a bunch! If you have any questions about this product by MOUNTOPZ, contact us by completing and submitting the form below. If you are looking for a specif part number, please include it with your message.